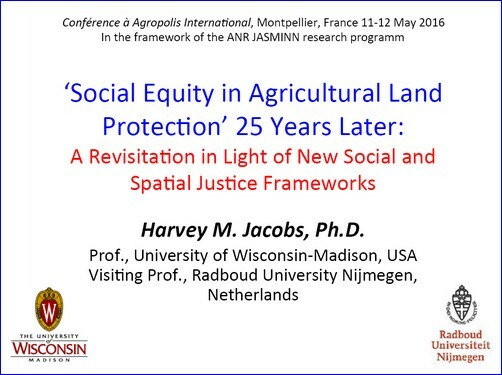 Further information: In 1989, H.M. Jacobs published Social Equity in Agricultural Land Protection (Landscape and Urban Planning, 17, 1: 21-33), exploring how an equity lens brings insight to agricultural land protection policy strategies. Since the article’s publication, public and policy interest in peri-urban agricultural land protection has proliferated globally. In the same period, issues of social justice have also expanded through a focus on matters such as human rights and new environmental perspectives. This paper-presentation revisits and expands upon his 1989 article through an exploration of some of the social and spatial justice frameworks of the last twenty years.